The most under utilized muscle group in the entire body are the abdominals. The rectus abdominis, obliques and transversus abdominis make up a majority of the “Core” muscles of the abdominals. 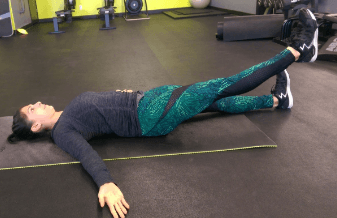 They are responsible for a solid body foundation that promote stability and balance as well as aid in total body strength and proper breathing. 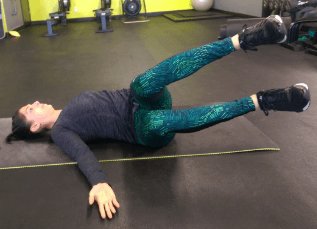 Having a “weak” core or not engaging the core at all can lead to lower back issues such as hernias from bending over to pick something up off the ground. It can also cause imbalance issues where the shoulder can become injured because the core is not helping to support a simple movement like opening a door. Every movement we perform, even just sitting and standing requires the abdominals to support the back and keep our posture in line. 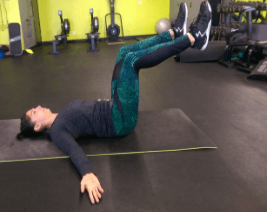 When the abdominals are weak or not used life can become difficult when it comes to just simple movements. No one wants to end up hunched over and have chronic back pain so having a strong core is key to a happy, healthy life. 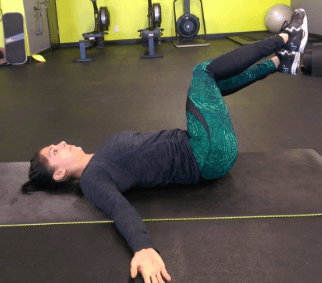 Below are some exercises that are helpful for getting back into strength training the abdominals and promoting a healthy spine as well as healthy body. The three exercises should take at most 5 minutes to perform, so there is no excuse why you would not have time to do them! Lay on back, raise both legs to waist height and knees bent to 90 degrees. Keep back flat and movement controlled through breathing. Press hands against wall to engage upper core. Hold 30sec x 3 times. Lay on back, both legs in tabletop. Torso stable swing legs side to side with knees bent at 90 degrees and do not let them touch keep 4in distance between the two. Legs most side to side 30sec x 3 times. Keep your back flat and control breathing through nose and belly. Slowly raise 1 leg up, toes toward shin while exhaling and lower down inhaling. Do 10 reps R/L x 3 sets.